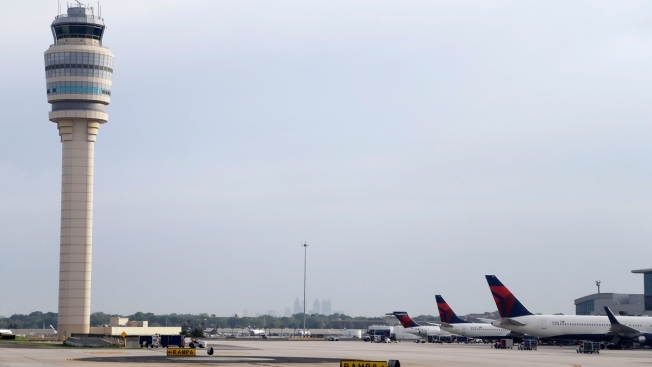 A file photo from Hartsfield–Jackson Atlanta International Airport, in Atlanta. Gale the show dog was reunited with her Dutch owner Tuesday after vanishing at Atlanta's airport over the weekend. Floris van Essen told news outlets his dog went missing while waiting to board a flight to Amsterdam. The American Staffordshire terrier was in a crate and had gone through security with another dog about three hours before their flight was to leave. The dogs had been heading home after being shown in the U.S.
About 10 minutes before boarding at Hartsfield-Jackson Atlanta International Airport, the dog's handlers were told that when workers went to load the dog's crate, they discovered it was empty. Van Essen, who had flown home to the Netherlands before his dog. WGCL-TV reported that KLM Royal Dutch Airlines said in a statement the dog broke out of its cage and went missing Saturday. On Tuesday, the airline tweeted that the dog had been found. An official later said Gale was found in a rock quarry.